The time has arrived; we have decided that we are going to build a new swimming pool. What should we do first? Here are some ideas to get you started down the right path and on your way to your new fun filled backyard. The best way to start the process is to locate a property survey, if available, to determine the amount of space available for your new swimming pool. Once you have reviewed the survey, scope out your property and decide the best area and location for your new pool. Try to determine the shape of your pool, where you would like the shallow and deep end, location of the steps, location of water features, equipment location and size and area of the deck. Also think about fencing which may be required, landscaping, outdoor kitchen areas, entertainment areas and yard lighting. The next item for consideration is which contractors will you have visit your property and offer a proposal for your new swimming pool? This is an important decision and should not be taken lightly. Choose swimming pool contractors which can offer ideas and suggestions for your new backyard oasis. Contractors should not be afraid to offer corrections and improvements to your ideas if necessary. Review contractor’s licenses, insurance and background before selecting any particular builder for your project. One of the most important items to consider in today’s pool market is, choose a contractor who can offer 3D design pictures of your new backyard swimming pool in the completed stage. Computer software is now available to design and show your new swimming pool, spa, water features, landscaping, planters, outdoor furniture, equipment location, outdoor kitchens and deck areas. Pictures should also show fencing, the house in relationship to the pool, rivers, lakes or ponds in the surrounding areas. 3 D images and pictures can show different colors of tile, decking, pool interior finishes and lighting. Contractors should also offer different views of the pool and also be able to show various shapes and designs which would function on your property. 3D design pictures are a great way to see and predict how your new backyard is going to look. 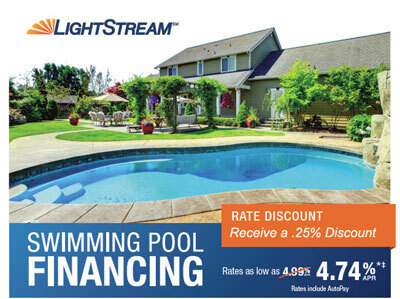 Don’t settle for a flat sketch or drawing, demand to see your new pool in its completed mode. Use the pictures to help consider other items such a landscaping and fencing which should be considered when costing out your project. Once your contractor has been chosen and the construction has begun, have fun watching your 3D design turn into reality. Copyright © 2017 Rite-Way Pools. All rights reserved.